Lanzarote has some spectacular landscapes to enjoy, from sandy beaches to dramatic black mountains. However, did you know that some of the island’s most awe-inspiring sights can be found beneath the surface? Within half an hour drive of our Santa Rosa property, there’s a network of volcanic caves and hollows to discover, full of surprises that are sure to take your breath away. Just 25 minutes’ drive from Santa Rosa, you’ll find the Cueva de Los Verdes. Loosely translated to ‘the Cave of Greens’, it’s part of one of the longest volcanic tunnels in the world. The 6km long lava tube was formed 4,000 years ago when then Montaña La Corona erupted. 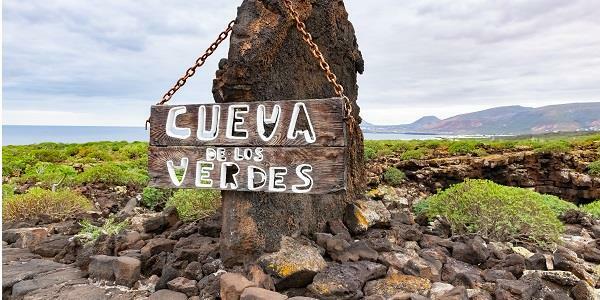 During the 16th and 17th Centuries, Cueva de Los Verde was used as a hideout by local people who needed protection from pirates coming in and attacking from Africa. In fact, during the 1618 attack from Tabán Arraez and Solimán, locals lived in the caves for 2 whole months. In 1964, 2km of the caves were opened to the public, having been transformed into a truly spectacular attraction by the artist Jesus Soto. Keen to avoid making too many changes to the caves themselves, Solo instead focused on lights and shadows to create his installations, highlighting the impressive shapes, textures and colours of the rocks. The natural colour changes are down to the iron and salt in the rock, changing the shades from red to white. During the tour, which lasts about an hour and is the only way to explore the caves, you will visit several interesting sections, including Pie del Guanche (Guanche’s Foot), Cabeza del Monstruo (The Monster’s Head), La Cripta (The Crypt) and Horno del Diablo (The Devil’s Furnace). 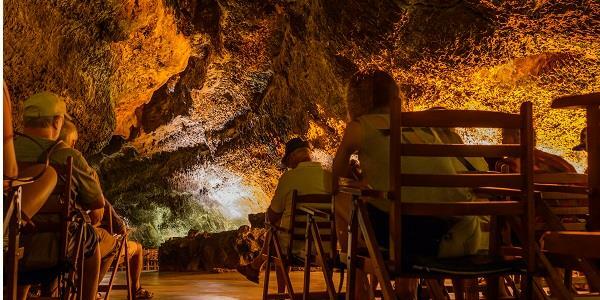 You will also be shown the cave’s famous natural auditorium, which hosts several unforgettable classical concerts throughout the year – a definite must for any music lovers! You can find dates and tickets for these here. At €8 for an adult ticket and €4 for children, Cueva de Los Verdes is well worth a visit. 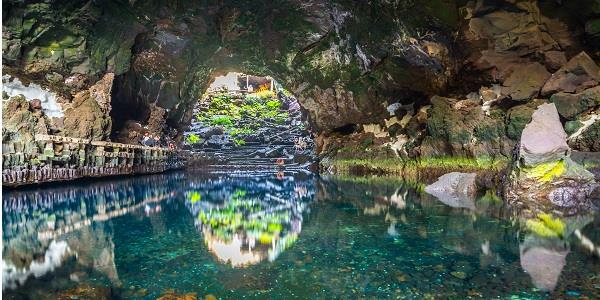 Discover some of the most fascinating volcanic structures on Lanzarote, and marvel at the optical illusions, surprises and majesty hidden within the famous tunnels. However, please bear in mind that some sections are quite low and/or narrow, and some may find it claustrophobic. The Cueva de Los Verdes is also not suitable for those with limited mobility. 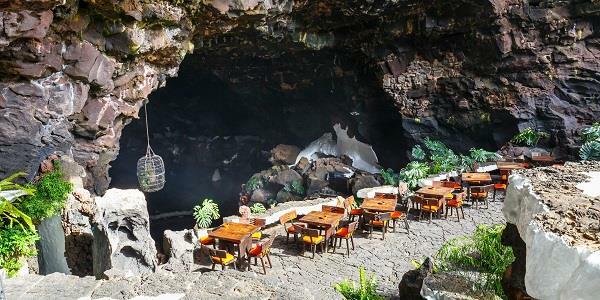 Only 5 minutes down the road from Cueva de Los Verdes is the famous Jameos del Agua. Also created in the 1960s, this is the brainchild of Cesar Manrique, Lanzarote-born architect and artist. Made from the same volcanic tunnel as Cueva de Los Verdes, the site was created from sections where the roof of the tunnel has collapsed, leaving a series of caves and openings in the ground. Entrance costs €11, after which you descend a staircase into the first cave. Here you will find a one-of-a-kind café and bar built into the stone walls. Take a seat at one of the tables, which are laid out across the floor of the cave, and admire the view over the small-yet-stunning natural lake. Surrounded by vegetation and natural ornamentation, it’s a truly unique place to stop and enjoy a bite to eat, although booking may be required during busy seasons. You’ll notice that the lake, with its crystal-clear waters, contains thousands of little white dots. On closer inspection, these will reveal themselves to be tiny albino crabs. These rare crabs are blind and extremely rare. In fact, they can only be found here, and have therefore been adopted as the symbol on Lanzarote. When you’re ready to move on, you’ll find another path on the far side of the lake. This emerges back into the daylight, where some fabulous foliage covers the rocks and pathways. 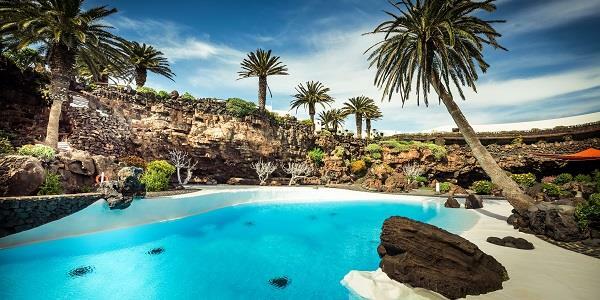 Here you will also find a picture-perfect swimming pool, with turquoise waters contrasting dramatically with the dark volcanic surroundings. Unfortunately, swimming is not allowed… it’s said that only the King of Spain is allowed a dip in these waters! There is also an auditorium further along, which hosts exciting cultural and entertainment events throughout the year. Last but not least, don’t miss the Casa de los Volcanes. This avant-garde building is actually a small museum, containing many facts and interesting exhibits on volcanology. You can also view instruments showing live temperature measurements and movements of the earth beneath your feet. From fascinating geological features to beautiful scenery, there’s something for everyone to enjoy in these unique underground settings. But once you get back above ground, you’ll need somewhere special to relax and relive your adventures. With it’s comfortable accommodation and excellent facilities, our beautiful Santa Rosa property is the perfect base from which to explore the island. To find out more about our Santa Rosa property, as well as our 31 additional locations, simply request a brochure.